Archie Comics has provided ComicBook.com with an exclusive look at the solicitation text for their Archie Action lineup of titles due out in June 2015...except for a few the publisher will debut at a later date because they've got some surprises up their sleeve. 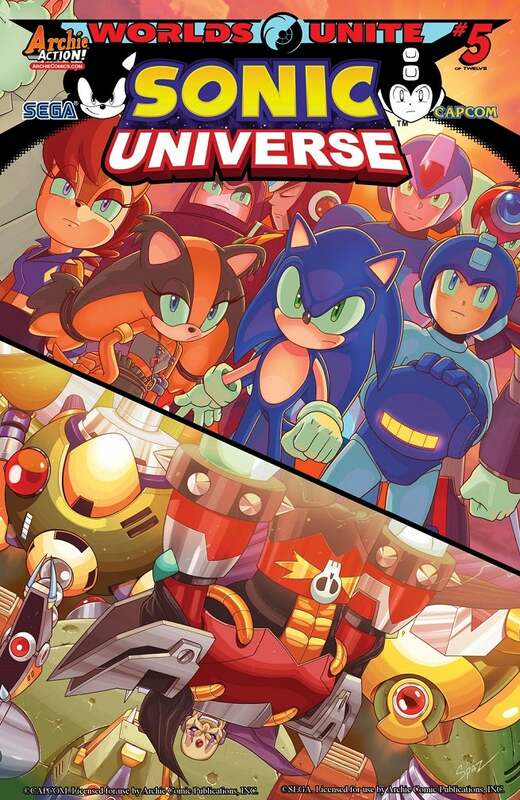 Included in this batch are the next three chapters of the video game crossover event "Worlds Unite" featuring the characters and universes of Sonic, Sonic Boom, Mega Man, Mega Man X and more. The event is a sequel to the popular 2013 crossover "Worlds Collide." You can check out the solicitation text and covers below. 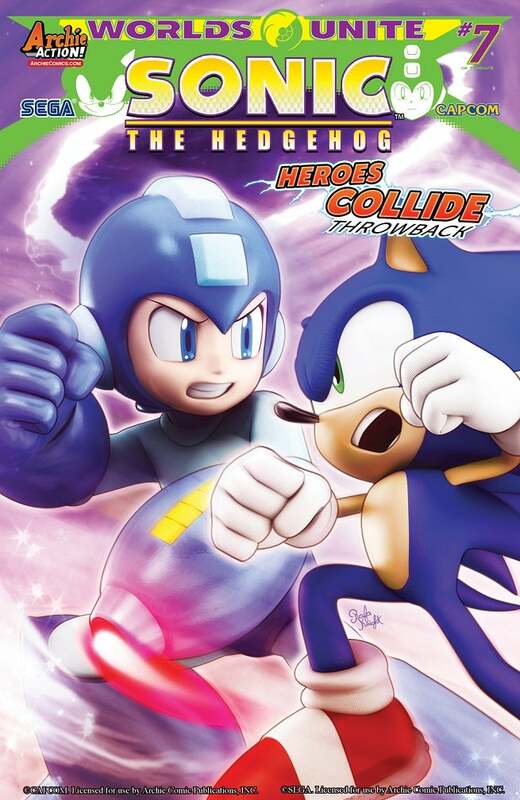 Celebrate 50 issues of Mega Man with the latest chapter in the globe-smashing SONIC/MEGA MAN crossover event! "Worlds Unite" Part Four: Act One comes to its mind-blowing conclusion! Sigma’s plan reaches its first stage, and the worlds of Sonic and Mega Man have fused! It’s definitely going to take more than one hero to stop the threat from the future—maybe even ten! Sonic, Mega Man, X, Sticks, the Freedom Fighters, Robot Masters and Maverick Hunters—UNITE! PLUS: Stick around for a special bonus anniversary story as Mega Man and X meet for the first time! Featuring a wrap-around cover from the legendary Patrick "SPAZ" Spaziante! PLUS 5 variant covers from Edwin Huang, Irvin Rodriguez, Patrick Thomas Parnell, Roger & Idalia Robinson and part 4 of the epic 12-part connecting variant cover series by artist Ben Bates! The next exciting chapter in the SONIC/MEGA MAN "WORLDS UNITE" crossover event starts here! 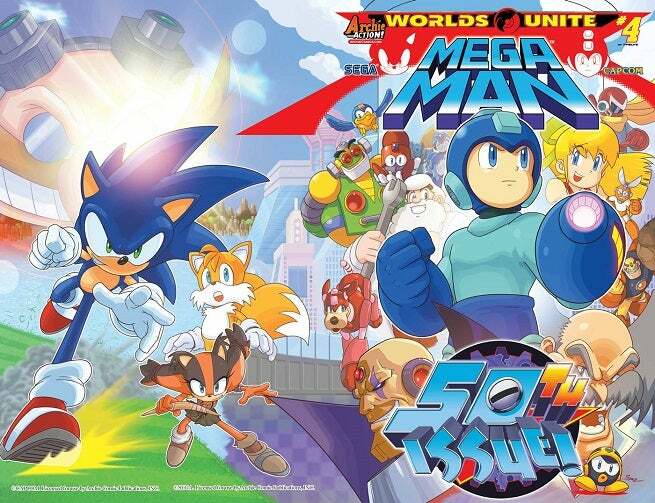 "Worlds Unite" Part Five: The worlds of Sonic and Mega Man have been joined together by Sigma, and it’s going to take a full-on army of unified heroes to make it right! Actually—scratch that—it’s going to take some heroes AND some villains! When the mysterious and malicious Xander Payne inexplicably arrives with Drs. 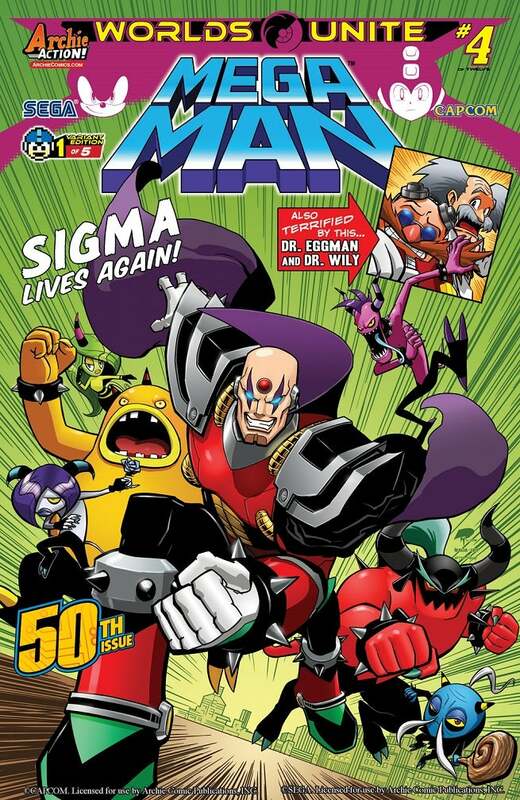 Eggman and Wily in tow, our heroes get new insight into Sigma’s plans! Featuring cover art from the legendary Patrick "SPAZ" Spaziante and variant cover art from CLAUS-Justin Harder (Thor: the Dark World, SNL) and part 5 of the epic 12-part connecting variant cover series by artist Ben Bates! The heroes of the SONIC/MEGA MAN crossover event: AT WAR?! "Worlds Unite" Part Seven: The unified army is not so unified anymore! What has driven Mega Man, X and their robot companions to attack Sonic and the Freedom Fighters? Drs. Eggman and Wily may have the answer! Or a weapon. Could a weapon be the answer? Or is it more trademark treachery? Meanwhile, Sigma grows in power, preparing for the next phase of his master plan! And speaking of masters, this issue features cover art from master-artist Patrick "SPAZ" Spaziante, a CG-SLUGFEST Variant cover from Rafa Knight and part 7 of the epic 12-part connecting variant cover series by artist Ben Bates! 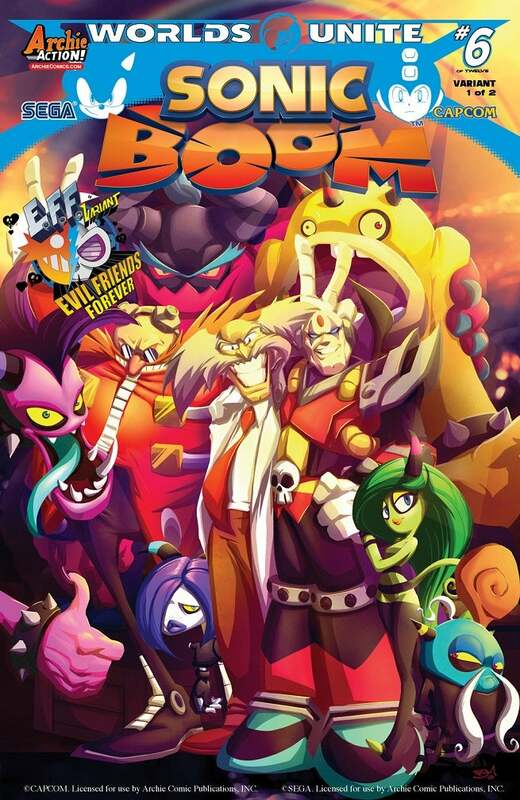 Treachery and mystery abound in the next exciting installment of the SONIC ARCHIVES graphic novel series! Sonic finds himself caught in the middle as heroes and villains alike plot and plan their own agendas—what’s a super-speedy hedgehog to do? Dr. Eggman draws his wayward people into a city-sized trap! The power of the kingdom is snuck out from under Princess Sally by a double-sleeper agent! Sonic faces down his super-powerful cyborg rival! 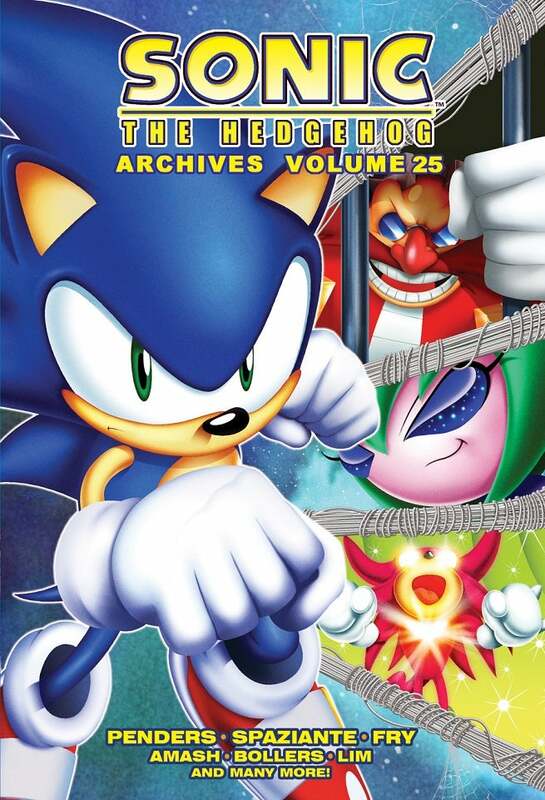 SONIC ARCHIVES VOLUME 25 collects SONIC THE HEDGEHOG #92-95.